Marketing to Parents 101: Mobile is now an essential element of your back-to-school campaign. Nearly 70 percent of respondents to a Bizrate Insights survey plan to use mobile devices to research back-to-school products for the new school year, reports eMarketer. And 40 percent said they'd use their devices to compare prices, look for coupons, and read product reviews—all while in a store. Forty-eight percent of respondents also said they would use a mobile device to purchase products. Ultimately, marketers who want to influence the purchasing decisions of parents during the year's second-largest retail season need to be where they're making those decisions, and that is increasingly on mobile. You need to research the start dates of schools in your target markets: Do they hold off until after Labor Day, or bring an earlier end to summertime fun? Scheduling may contribute to when shoppers open their wallets. Bizrate Insights finds that while 40 percent of respondents do their back-to-school shopping in August, more than half begin earlier, even as early as June, eMarketer reports. Bazaarvoice notes there are later opportunities to reach in-market shoppers, too. Consumer electronics and office supply clients see an uptick in back-to-school product pageview traffic in September and October, when people think about forgotten purchases. But there are other timing considerations to make as well, like what time of day your potential buyers will be most receptive to mobile advertising. A Google study found that parents were researching and shopping on their mobile devices throughout the entire day, from little breaks in the car waiting to pick up the kids to during commercial breaks watching TV at night, so it's important to study the trends of your audience and respond accordingly. Study the historical customer behavior trends of your website and ad campaigns, and most importantly, constantly test varying deployment times to optimize performance. You may find your best customers are those checking their phones after dark. There are times when prospects have a physical presence in an optimal spot. Consider ways to use location-based targeting like geofencing to send an ad to shoppers who are close to your store—or near a competitor's. In addition, stores utilizing beacon technology can send coupons to app users who are shopping inside. You can take your location-based marketing strategy a step further on native apps like Waze. You can target users who have recently visited your store and also those of your competitors. For example, if you are a brand like Target, you may want to come up with a back-to-school campaign which targets Wazers who frequent Walmart and then tailor the messaging for those that already are loyal Target shoppers. You should also make social media a part of your integrated back-to-school efforts. Edison Research found that 62 percent of moms with smartphones use social media several times a day, and that those who are Facebook users check the platform an average 10.5 times in 24 hours. Buying ads on social networks can help you connect with these social moms in a popular environment, especially when you use the more personalized tactic of retargeting women who have visited your website without making a purchase. Creating useful and shareable social media content can also be effective when marketing to parents. MediaPost notes that Staples used a social strategy last summer to engage moms through its #101Ready campaign. Content included do-it-yourself projects, information about sales, and organization tips. The strategy made up 78 percent of Staples' summer Instagram content and drove 85 percent of its likes and comments on the platform. This back-to-school season, make sure your marketing strategy makes the grade by including a strong mobile campaign that lasts throughout the season and capitalizes on both social and local. 1. 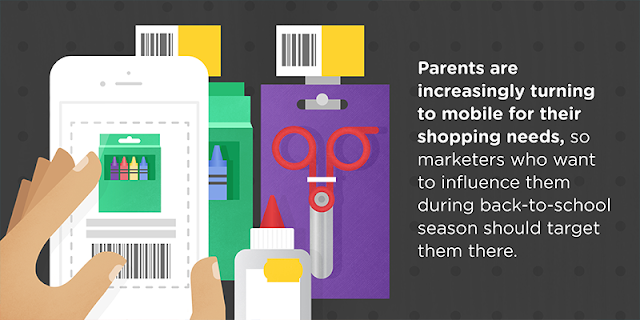 Parents are increasingly turning to mobile for their shopping needs, so marketers who want to influence them during back-to-school season should target them there. 2. Keep in mind that parents are doing back-to-school shopping throughout the summer and even into the school year; don't assume everyone shops in August. 3. Use location-based targeting to send ads to your customers when they're in your store (or near your competitors' stores).